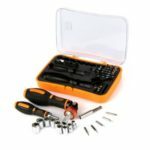 The JAKEMY JM6121 screwdriver set includes various interchangeable screwdriver heads with strong and durable quality. Adjustable extension and multi-angle soft extension bar for higher work efficiency. 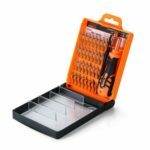 It is equipped with a box to store the screwdriver&apos;s head with a lightweight design, easy to carry anywhere. 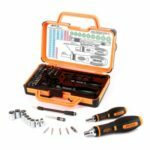 33-in-1 repair tools set, including various interchangeable screwdriver heads, meeting your different maintenance demands. 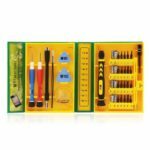 Applicable to home appliances, furniture, general repair and car maintenance. Non-slip handle for a secure and comfortable grip, easy to operate. 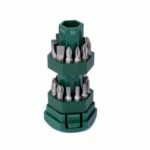 Comes with adjustable extension and multi-angle extension bar, a magnetizer and a marble connector for higher work efficiency. Crafted with CR-V (Chrome-Vanadium Steel) materials, solid and sturdy, extremely durable in use. 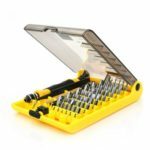 It is equipped with a box to store the screwdriver&apos;s head with a lightweight design, easy to carry everywhere.